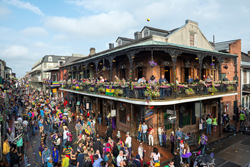 Whether you’re throwing footballs, tossing Mardi Gras beads or blowing kisses, February 2016 is a busy month full of excitement and great inspirations for travel. Viator, a TripAdvisor company and the leading resource for tours and activities worldwide, is the one-stop-source for making the most of multiple getaways any time of year. First time visitors in town for the big game or travelers planning a future getaway to the City by the Bay will all be winners when exploring San Francisco with Viator. The trophy-worthy Alcatraz and San Francisco City Tour takes in the city’s major attractions including the infamous Alcatraz, Fisherman’s Wharf and Chinatown, while the Big Bus San Francisco Hop on Hop off Tour provides a go-at-your-own-pace overview of everything the city has to offer. Taking it beyond city limits, the Yosemite National Park and Giant Sequoias Trip explores the rugged beauty of the Sierra Nevada. And for those who want to raise a glass to the winners on the gridiron – travel slightly north and visit Napa and Sonoma with Viator for wine tastings, vineyard tours, customized experiences and hot air balloon flights. Carnival is celebrated around the world with different cultures incorporating different traditions – but one thing is consistent, it’s a big party. Viator’s Mardi Gras experiences in New Orleans include VIP parade perches, a multi-day, über-VIP experience that includes riding in the Krewe of Orpheus parade, and year-round behind-the-scenes access to Mardi Gras World – design studio and off-season home to the iconic parade floats. Experiencing Carnival in Rio with Viator means one thing – getting out to Samabadrome. Various packages include parade tickets along with transportation, and sometimes even a costume. Experience Carnival off-season with a visit to Cidade do Samba (home to the beautiful costumes and floats) as well as access to samba school Carnival rehearsals that begin in August and run through January 2017. In addition to a vast selection of romantic-themed, year-round experiences (horse-drawn carriage rides, Las Vegas wedding packages and more), Viator features a collection of Valentine’s Day celebrations around the world, perfect for local lovers and amore abroad alike. Step aboard various yachts, tall-ships and dhows for unforgettable cruises in Paris, London, New York, San Francisco, Budapest, Dubai, and Sydney. Back on land, enjoy a brewery tour for couples in Minneapolis, a gourmet dessert walking tour in New York, or a romp at the Crazy Horse Cabaret in Paris. For more information on these experiences, tours and attractions, as well as the latest deals, promotions, contests and news, visit http://www.viator.com or follow Viator on Facebook (ViatorTours) and Twitter (ViatorTravel).